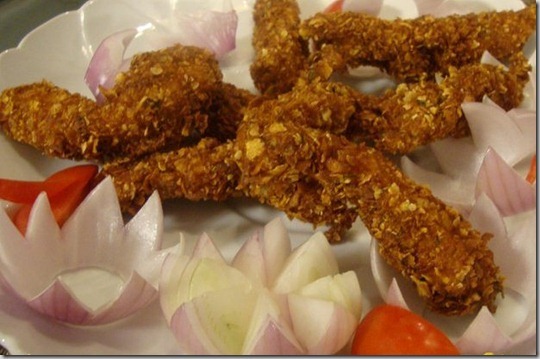 Here is the recipe for high tea chicken by chef Zakir. You can make this chicken with tea or with dinner. Clean ½ kg chicken breast and hammer lightly with a steak hammer. Then cut the chicken into strips and mix with ½ tsp. black pepper, ¼ tsp. white pepper, 1 tbsp. red chili flakes, 1 tbsp. ginger garlic paste, salt to taste and 1 beaten egg. Also add ¼ bunch sliced coriander, 3 tbsp. corn flour and plain flour and mix thoroughly. Fill a plastic bag with crushed corn flakes and one chicken strip and hammer. Repeat the process with all chicken strips and deep fry. Serve crunchy Hi- Tea Chicken with tomato ketchup.